Taking your medications at the right time is crucial to managing many illnesses, but a recent survey shows many Canadians have trouble doing that. Now, a dispensing system used in institutions to help keep patients on track is being offered to consumers for the first time. Nicole Robinson shared her experience after signing up with PocketPills, an online service that delivers medications right to your door. 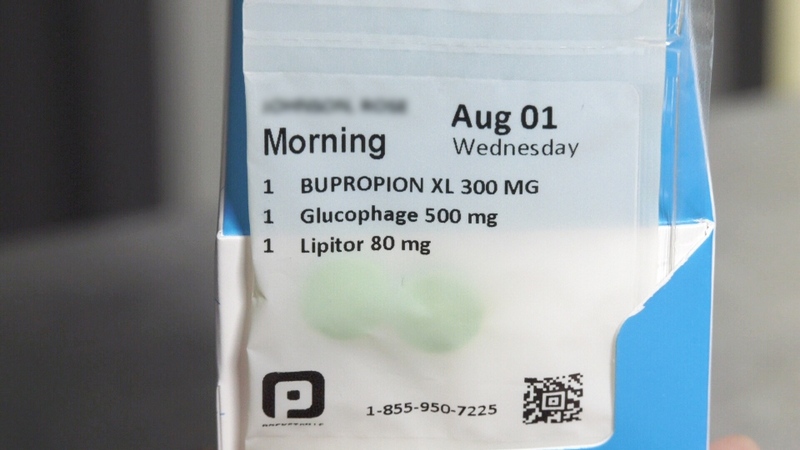 They come in individually sealed packets stamped with the names of the drugs and the date and time when they should be taken. “Oh, it’s so convenient,” said Robinson, who manages her diabetic condition with various medications. “Medication management is really frustrating if you have a lot to take,” she said. Now she says she just tears a couple of packets off of a strip and throws them in in purse and goes on with her day. “Pocket packs really help with adherence. Adherence is a big problem with Canadians,” said PocketPills CEO Harj Samra. Samra recently gave CTV News a tour of the company’s dispensing facility in Surrey. He showed us a sorting machine that can hold up to 500 medications and sort them at one pill a second which can be combined with other medications and sealed into individually sealed packages. The rolls of packages are then checked for accuracy with another automated machine and reviewed by a pharmacist. “We’re one of the first in North America as well to put this into a consumer packet that is deliverable to anybody,” explained Samra. The system is great for anyone with multiple medications to manage and for those with memory issues and seniors who have difficulty sorting pills. “People with dexterity issues, where they may not be able to open up or they were spilling medications, that also is solved with our pocket packs,” added Samra. Pocketpills launched in the fall of 2018 and Robinson signed up after seeing a social media post about it. She can order through an app, get reminders, set up automatic renewals and directly communicate in real time with a pharmacist. “Even when I’ve had like urgent medications, they’ve delivered right to my door when I needed it,” Robinson said. The app also lets you search the price of the drugs you need so you can compare prices with other pharmacies. PocketPills charges a $7 dispensing fee which is charged for each medication on each order, whether it’s a 30 day supply or longer. The company will coordinate payment with your insurance company and also work with your doctor to renew prescriptions.